“Until very recently, the discussion revolved around the kind of society we would have. For those concerned with the fate of the earth, the time has come to face facts – not just the environmental crisis but the need for fundamental social change. Hot Earth, a new pamphlet just released by the CPA, joins the debate about the environmental crisis at a time when the Gillard government’s carbon tax is being discussed in Parliament and Coalition Leader Tony Abbott is parading his “direct action” plan which allows polluting corporations to get away with murder. Hot Earth rejects both options, demanding instead regulations and penalties to control carbon emissions by corporations – before it is too late. It is beyond debate that the earth’s environment – the source of life for humans and all other species – is under sustained and severe attack by human activities. It is also clear that the effects of continuing down the same path will be devastating. Humans have always impacted and changed the natural world through their productive activities from the burning off practised by Aboriginal hunter-gatherers in Australia to grazing herds, ploughing and irrigation. However, changing nature does not necessarily mean damaging or destroying the environment. With the development of productive forces, the creation of surpluses and the emergence of private property and classes, an ideology of exploitation and mastery developed which began to be reflected in attitudes towards nature. A separation between humankind and nature grew in people’s ideas and nature began to be a thing to be used. The uncontrolled exploitation of the environment and the plundering of natural resources intensified under feudalism and reached its peak under capitalism. Today developed capitalist countries are using all the achievements of science and technology to “master” nature. A consumer and predatory attitude to natural resources is characteristic of capitalism and, with the scientific and technological revolution, not only leads to their exhaustion but also brings with it a train of negative and, in some cases, possibly irreversible consequences for the environment. The environmental crisis arises from social and philosophical attitudes rather than from technology which is a creation of human endeavour. The system that directs the whole course of scientific and technological progress to the making of profit and the exploitation of humankind and nature is mainly to blame for the environmental crisis. Capitalism’s basic driving force and its whole reason for existence is the amassing of profits. The environment exists as a realm to be exploited in a process of growing economic expansion. Corporations, and the system itself, must either grow or die. Companies have no loyalty to anything but their own bottom lines. For the capitalist it is a matter of indifference whether what is produced is useful or harmful for individuals or society. They will be produced if a market exists or can be created for them and if they yield an adequate profit. The environmental damage their production may cause is equally a matter of indifference. Leaders of the capitalist system are unable to conceive of or promote a different economic which gives priority to human and environmental needs, as opposed to profits. There is nothing in the nature of the system that will allow it to pull back before it is too late. To do that, other forces are needed. Continuing “business as usual” is the path to global disaster. “Solutions” which allow the current system of production and distribution to proceed, are not real solutions. They will actually make things worse by giving the impression that the crisis will be overcome when the reality is quite different. The overwhelming environmental problems facing the world and its people will not be effectively dealt with until we institute another way for humans to interact with nature. We need a system of sustainable human development. This means enough for everyone and no more. Within the capitalist system, some things have been done and more can be done to lessen capitalism’s negative effects on the environment and people. 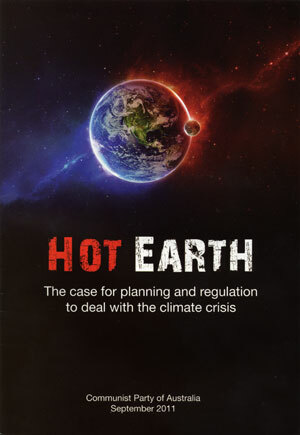 Hot Earth presents the case for steps to start resolving the climate crisis by challenging the power of the corporations and introducing laws and penalties to restrict their activities which are killing the planet. It also argues for protection of workers’ employment, public ownership, nationalisation, price and profit controls, expanding public transport, cutting military spending and other steps which campaigns can begin to win within the capitalist system. But the environmental crisis cannot be solved within the present system. The various suggestions for doing so have no hope of success. The system of world capitalism is clearly unsustainable. The transition to a sustainable – and socialist – economy will be a complex and hard fought process. Fundamental change is needed. This means economic and social change, and a new politics built on the new economic base. “The struggle for sustainable development is in essence a struggle to restrain and restrict capitalist corporations and to compel an end to environmentally damaging production processes. A new world is not only possible, it is essential. And a broad popular movement, united in action, working to protect the planet and humanity, can and must bring about the necessary social change. This is where Communists have a responsibility. We have to work as hard as we can to help expand, unify and galvanise this movement to bring about social change. We have only ten to 15 years to address the crisis of climate change and prevent catastrophe. What we do now will determine the future of planet Earth. Hot Earth is available for free download here.